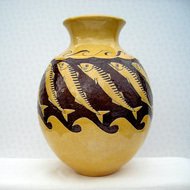 Sgraffito vase with mackerel decoration. 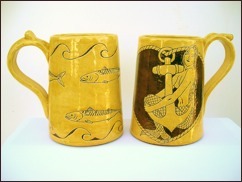 Welcome to the web site of Cornwall-based craftsman Ken Luckhurst, who specialises in traditional English Slipware Pottery – with sgraffito design. 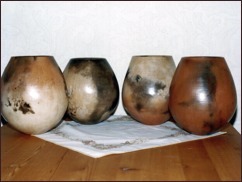 This attractive type of pottery is made using red earthenware clay that has been covered with a thin layer of white clay known as slip. 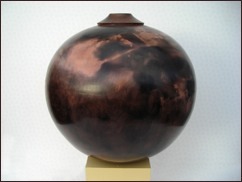 Through this slip layer I scratch and etch a design that reveals the underlying red clay, creating a strong contrast between the two colours. 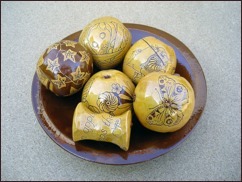 Traditional slip decorated pottery lends itself well to making commemorative ware or gifts for birthdays, weddings, births, retirements etc. 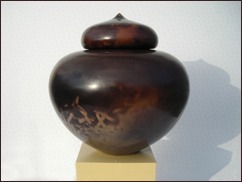 I enjoy creating pots that mark an event as I know that, if looked after properly, they will be around for many years and can be passed down through the generations. 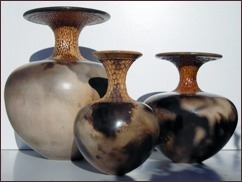 I use various techniques for making my pottery which are coiling, throwing, slabbing and press moulding, all of which enable me to make a wide range of pottery shapes. 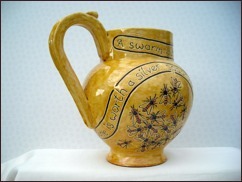 i sell my work through local galleries and am often commissioned to make a pot for a special event.